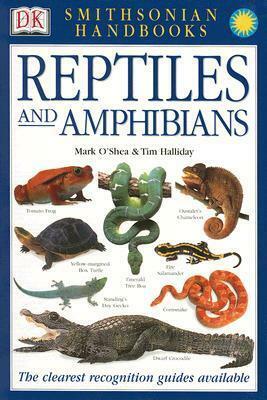 The most comprehensive and easy-to-use pocket guide to the reptiles and amphibians of the world, with beautiful color photographs and authoritative text from an expert herpetologist and a biology professor specializing in amphibians. Packed with over 600 color photographs of more than 400 species, this handbook is designed to enable you to recognize each species quickly and easily. World-renowned herpetologist Mark O'Shea, best known for his Animal Planet/Discovery Channel show O'Shea's Big Adventure, teams up with Tim Halliday, former biology professor at the Open University and one of the world's leading authorities on amphibians, to write expert-level entries highlighting the chief characteristics and distinguishing features of each species, accompanied by crisp, detailed photos. A comprehensive introduction describes the anatomy, lifecycle, and behavior of the major groups of reptiles and amphibians, while the initial steps of identification are facilitated by a clear visual key. Whether you're spotting animals in the field or browsing the fascinating world of wildlife from the comfort of your home, this Dorling Kindersley guidebook is a great resource for any nature-lover. Mark O'Shea is curator of the reptile collection at the West Midlands Safari Park, England. He has made several films for television, including programs for the Discovery Channel and O'Shea's Big Adventure, shown on Animal Planet. Tim Halliday is a professor emeritus of biology at Open University in the UK. Professor Halliday's academic specialty was in the study of newts, toads, and frogs. He researches declining amphibian populations worldwide. He was the amphibian consultant for Animal: The Definitive Visual Guide, which Outside magazine called "the ultimate zoological reference." Jonathan Metcalf has been the publishing director of DK Knowledge since 2011.